Afghanistan Map of War, July 13-16, 2015 5 out of 5 based on 1 ratings. 1 user reviews. 1. On July 13, Afghan officials from the northern Faryab province reported that Taliban militants have taken control of 40 villages in the Shirin Tagab district. Taliban representatives confirmed the “clearance” of 22 checkpoints and 40 villages in the Astana Baba region: Qazal Sai, Yaktut, Nawabad, Goraghali, Aritu, Shori Qara, Takht Eshan, Chil Qaduq, Qul Bandi, Sur Qushlaq, Sari Astana Baba, Khwaja Anjir, Gul Qadugh, Shor Bazar, Kohna Qushlaq, Lalka, Karwan Sang, Mulai, Haji Zarif, Haji Jora, Tashlek, Haji Karim, Qarmaqol, Azeem Sari, Maghetu Kalan, Maghetu Khurd, Mahd, Aat Qamar, Farhad, Aal Batur, Bughra, Sardaba, Tetash, Ghor Jari, Jamshed and Nurzai. Additionally, at least 200 militants of “Islamic Movement of Uzbekistan” have been taking a part in the Taliban’s actions in the province. 2. 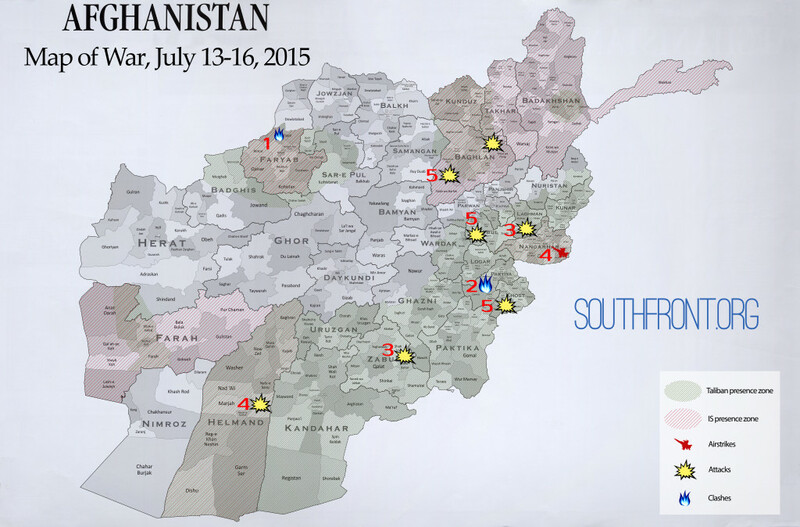 On July 14, Afghani government forces launched counter-attack in the Faryab province, reporting the recapture of a number of settlements and the elimination of over 130 Taliban militants. However, the Taliban reported only two causalities and two injuries, while insisting the causalities of the government forces are numerous. Afghani government forces also cleared the districts of Samankay and Janiheyl of the Paktiya province. According to the information of Afghan officials only 4 government troops were injured and only 3 were killed. 3. On July 15, 5 locals were captured on the Kabul- Jalalabad road by an unknown group of militants in the Kargai district of Lagman province. Militants killed 5 locals and injured 3 during a firefight with police in the Now Bahar district of Zabul province. As result of that firefight 2 militants were killed, and 1 policeman was injured. 4. On July 16, a suicide bomber attacked a police checkpoint in the city of Lashkargah in the Helmand province. Local sources report 3 servicemen killed and 5 injured. NATO-led airstrikes killed at least 28 Taliban militants in the Dih Bala district of Nangarhar province. Islamic State and Taliban militants operate actively in the province. 5. The recent attacks in Afghanistan have killed and injured more than 100 civilians, including women and children. The attacks in Khost and Baghlan Provinces and Kabul city occurred near spaces of public assembly, including a bazaar as well as mosque where civilians had gathered to pray.